Archie Comics #627: The one where Archie meets KISS. This week marks the fifth week of November and the first week following a big holiday. It has been my experience that this week - out of the whole entire year - leaves comic buyers with less new books available on Wednesday. However, one look at the release schedule this week confirms the true motive behind this anemic offering: fear. That's because this week KISS comes to Riverdale! And yes, we are talking about Archie Comics #627 also known as "Archie meets KISS!" If you have ever read an Archie comic, you know what is waiting for you behind the cover: A good, wholesome, fun story line that somehow never talks down to the readers. Archies are only rivaled by the Scooby-Doo gang, Dean said, “in terms of being eternal teenagers who team up with a variety of real-world guest-stars to overcome life obstacles, often to the strains of Sixties melodies." Eternal teenager and Archie universe pal Sabrina from "Sabrina the Teenage Witch" also makes an appearance in the KISS issue. “This particular crossover seems poised to rival even Archie's most surprising get-together of all time, a crossover with Marvel's Punisher. If you're a comic fan, you live for these bizarre little pop culture artifacts,” Dean said. In all seriousness, this is a fun book and the entry point of a four-issue arc. Four “variant” covers exist one each for issue #627 – # 630, each featuring the iconic makeup from a member of KISS. This book left me wanting to know what happens next, so I'm actually looking forward to getting next month's "Archie." 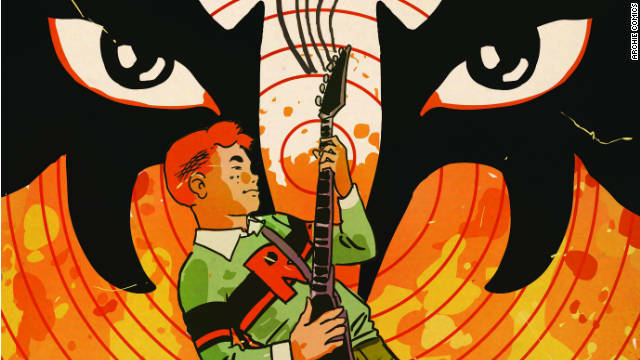 Dean said that even if only big Archie fans and the KISS Army purchase this comic, it will still sell pretty well - and I agree with him. But I think it's also worth a look for anyone who has forgotten how enjoyable an "Archie" comic can actually be. Until next week, go forth and read, my people, and the reading will be good! Here are some of the comics scheduled to hit the shelves on November 30, 2011. Your local retailer will probably have these and others, so make sure to check with them for more details. Mark Waid and Marcos Martin's Daredevil book is one of the best in the line right now, and deserves a look. I'd also encourage people to check out Thunderbolts, which is perilously close to cancellation.